Serious films about the afterlife are always tricky – answer questions with too great a degree of specificity and you will undoubtedly alienate audience members whose religious beliefs are different. Conversely, if your version of life-after-death is so ecclesiastically ambiguous that it can pass as all things to all people then what’s the point? Herein lies Hereafter. Directed by Clint Eastwood it stars Matt Damon as George Lonegan. George is a psychic however, unlike most psychics, he’s not a charlatan. The slightest instance of skin-to-skin contact with another person (even a total stranger) will fill his head with messages from a lost loved one. He finds these abilities exasperating; a curse that prevents intimacy with someone by forcing intimacy with everyone. Like a clairvoyant Shane, he has hung up his guns; forsaking fame, fortune and fortune-telling for factory work. The film follows two stories in addition to George’s; the first of them being French journalist Marie LeLay’s (Cécile De France) near-death experience at the hands of a tsunami. In a stunning opening sequence, we see her attempt (and fail) to outrun the oncoming onslaught of water. She is resuscitated by strangers just after “crossing over.” What she sees there causes her to become obsessed with what comes after. LeLay is ostracized by fellow media elites when she writes a book purporting to present scientific proof of the afterlife. But make no mistake; the film does not intend her to be some deluded professional chasing New Age hokum down the rabbit hole of religiosity. This film steadfastly and, more importantly, seriously believes in the afterlife. Now, that’s not necessarily a character flaw. However when a filmmaker not only takes that position but then has one of the movie’s main characters profess to have scientific proof, well…it’d be nice if that evidence consisted of more than just repeatedly stating that she has proof. Rounding out our trio of stories is Marcus (Frankie McLaren and George McLaren), a British boy whose twin brother has died. Such a loss is always hard on a child but the loss of a twin is a unique form of grief that few have any firsthand experience with. Eastwood is again, as he did in Gran Torino, working with children who are first time actors. And once again, those actors seem to have difficulty with some of the heavy lifting required as the film’s emotional stakes get raised. However, it was much easier to overlook this predilection in Gran Torino because the film dealt with Hmongs, a small, specific and insular ethnicity that aren’t well represented in the acting community. Such is not the case with the British. The movie’s fatal flaw is that it has no opinion on the afterlife other than that there is one. Like a supermodel wearing glasses, its tone creates an air of intellectualism that is punctured as soon as the talking starts. Eastwood devotes much of the movie to showing us that Damon’s character isn’t a fraud; but does that really matter when the actual messages from beyond are the same assorted collection of clichés and platitudes that hucksters have foisted on a gullible and grieving public for centuries? I don’t need an Oscar winning director to tell me that my loved ones are sorry for the pain they may have caused and want me to be happy. I can get that from an episode of Touched by an Angel. 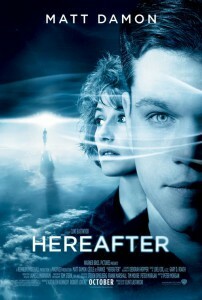 On a scale of 1 to 10, with 10 being Ghost and 1 being The Kid with the Broken Halo, Hereafter gets a 5.